Bale press EKOPACK meets the most demanding requirements of our customers with an emphasis on durability and reliability. Using multiplecontainers or continuous processing of various waste materials, which caneffectively sorted. By sorting waste you or your company contribute to the environment protection, saves storage space, time and money. Operation all bale pressers Ekopack is environmentally friendly and very simple. Hydraulic bale press with pressing force 5 tons. Bale press is composed from two parts. 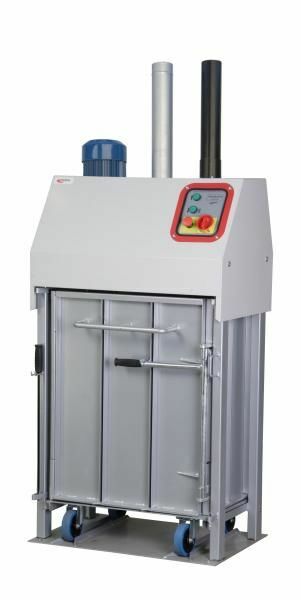 First part contains hydraulic press mechanism with electronically controlled pressing force, which ensures long-term reliability within reaching high pressure. The second part consist a removable mobile container that makes it possible sorting waste and also allows easy handling of pressed material before and after compacting. Automatic pre-pressing cycle significantly reduces the time required to operate the press. This bale press is suitable for small size companies and for customers with demand for easy use, small dimensions, low purchase price and big force.